Smell is perhaps our most evocative sense. In Marcel Proust's novel Remembrance of Things Past, the nostalgic flavor and fragrance of a madeleine, a delicate pastry, evokes a description of taste and smell, the senses that alone, more fragile but more enduring, more unsubstantial, more persistent...bear unflinchingly, in the tiny and almost impalpable drop of their essence, the vast structure of recollection. Humans often view smell as an aesthetic sense, yet for most animals smell is the primal sense, one they rely on to identify food, predators and mates. Indeed, for many organisms, odors are their most efficient means of communicating with others and interpreting their surroundings. Innate behavior in response to smell is essential to these organisms survival and most likely results from nonconscious perception of odors. Each individual has a unique, genetically determined scent. This olfactory identity is coupled with a remarkable ability to distinguish a diversity of odors. Humans, for instance, can recognize approximately 10,000 scents, ranging from the pleasurable scent of freshly cut flowers to the aversive smell of an angry skunk. Many animals have an even greater sensitivity to odors than humans do: bloodhounds, for example, are legendary for their extraordinary ability to discriminate scents. The wide spectrum of odors that humans consciously detect prompt varied emotional and cognitive responses. But do humans recognize other smells without a conscious awareness of this perception, and do such odors elicit innate behavioral responses? How does the perception of specific odors lead to appropriate thoughts, memories and behaviors? Whether smell is primal or aesthetic to a species, all organisms must have developed in the course of evolution mechanisms to recognize various odors and transmit this olfactory information from the nose to the brain, where it is decoded to provide an internal representation of the external world. As molecular biologists studying perception, my colleagues and I have reduced these questions to the level of genes and proteins. We have used these molecules to examine how animals recognize such a diverse array of scents and how the recognition of odors in the nose is translated into a map of odor quality in the brain. The basic anatomy of the nose and olfactory system has been understood for some time. In mammals, for example, the initial detection of odors takes place at the posterior of the nose, in the small region known as the olfactory epithelium. A scanning electron micrograph of the area reveals two interesting types of cells. In this region, millions of neurons, the signaling cells of sensory systems, provide a direct physical connection between the external world and the brain. From one end of each neuron, hairlike sensors called cilia extend outward and are in direct contact with the air. At the other end of the cell, a fiber known as an axon runs into the brain. In addition, the olfactory epithelium contains neuronal stem cells, which generate olfactory neurons throughout the life of the organism. Unlike most neurons, which die and are never replaced, the olfactory sensory neurons are continually regenerated. When an animal inhales odorous molecules, these structures bind to specialized proteins, known as receptor proteins, that extend from the cilia. The binding of odors to these receptors initiates an electrical signal that travels along the axons to the olfactory bulb, which is located in the front of the brain, right behind the nose itself. The olfactory bulb serves as the first relay station for processing olfactory information in the brain; the bulb connects the nose with the olfactory cortex, which then projects to higher sensory centers in the cerebral cortex, the area of the brain that controls thoughts and behaviors. SOMEWHERE IN THIS ARRANGEMENT lies an intricate logic that the brain uses to identify the odor detected in the nose, distinguish it from others, and trigger an emotional or behavioral response. To probe the organization of the brain, my co-workers and I began where an odor is first physically perceived--at the odor receptor proteins. Instead of examining odor receptors directly, Linda B. Buck, then a postdoctoral fellow in my laboratory and now a professor at the Fred Hutchinson Cancer Research Center in Seattle, and I set out to find the genes encoding odor receptors. Genes provide the template for proteins, the molecules that carry out the functions of cells. Once we isolate the genes that encode a protein, we can use them as tools to study the structure and function of the odor receptors themselves. Furthermore, using genes to investigate proteins is much simpler and faster than studying the receptors directly. By artificially manipulating genes, we can easily alter odor receptors in ways that help us understand how the molecules enable the nose and brain to perceive smell. After we understand how the receptors work, we can then study how olfactory information is transmitted to the brain and processed to permit the discrimination of smells. Using the technique of gene cloning, we were able to isolate the genes encoding the odor receptors. This family of receptor genes exhibited several properties that suited it to its role in odor recognition. First, the genes encoded proteins that fall squarely within a previously described group of receptors that pass through the cell membrane of the neuron seven times; these receptors activate signaling proteins known as G proteins. Early studies by Doron Lancet of the Weizmann Institute of Science in Rehovot, Israel, and Randall R. Reed of the Johns Hopkins School of Medicine have established that odor receptors, too, use G proteins to initiate the cascade of events resulting in the transmission of an electrical impulse along the olfactory sensory axon. Second, the genes encoding the odor receptor proteins are active only in olfactory neurons. Although nearly every cell of the body carries a copy of every gene, many genes are expressed only in specialized cells. The sequence of mammalian genomics reveals about 1,300 odorant receptor genes in mice and 350 genes in humans. (Each type of receptor is expressed in thousands of neurons.) Given that mammalian DNA probably contains around 25,000 genes, this finding indicates that in mice 4 percent of all genes are devoted to the detection of odors, making this the largest gene family thus far identified in mammals. The enormous amount of genetic information devoted to smell perhaps reflects the significance of this sensory system for the survival and reproduction of most mammalian species. The large family of odor receptors contrasts sharply with the far more restricted repertoire of receptors in the eye. Humans, for example, can discriminate among several hundred hues using only three kinds of receptors on the retina. These photoreceptors detect light in different but overlapping regions of the visible spectrum, so the brain can compare input from all three types of detectors to identify a color. Our data suggest that a small number of odor receptors would not be able to recognize and discriminate the full array of scents that can be perceived by mammals. Mammals can detect at least 10,000 odors; consequently, each of the 1,300 different receptors must respond to several odor molecules, and each odor must bind to several receptors. For example, the molecules responsible for the scents of jasmine and freshly baked bread are made up of different chemical structures, and each compound activates a distinct set of receptors; to distinguish the smell, the brain must then determine the precise combination of receptors activated by a particular odor. How does the brain identify which of the 1,300 types of receptors have been turned on? Several scenarios are possible. If every neuron carries all 1,300 types, every neuron would send a signal to the brain every time an odor was sensed. All the engaged receptors would need to contribute some distinctive component to the neuron's signal; the brain could then compare these signals to decipher the identity of the smell. Alternatively, if each neuron features only one type of receptor, the problem of distinguishing which receptor was activated by a particular odor reduces to the problem of identifying which neurons fired. Such a model would greatly simplify the task of the brain in sorting out which of the numerous receptors have been activated. TO INVESTIGATE WHICH of these two schemes occurs in the detection of smells, we again looked at gene expression in the olfactory neurons. Using the procedure of molecular hybridization, Andrew Chess, John Ngai and Robert Vassar, then all at Columbia University, and I observed that in mammals, each of the 1,300 receptors is expressed in about 0.1 percent of the neurons. In fish, which have 100 odor receptors, each receptor can be found in about 1 percent of the neurons. These results suggest that, in both cases, each neuron may express only one receptor gene. Furthermore, in more recent experiments, Catherine Dulac in my laboratory and Buck independently have used the polymerase chain reaction, which amplifies small parts of DNA, to clone the odor receptor genes that are expressed in individual olfactory neurons. When such receptor genes are isolated from a single neuron, they all appear to be identical. When the same procedure is applied to a collection of neurons, however, hundreds of different receptor genes are obtained. Taken together, these observations indicate that each sensory neuron expresses only one receptor and is therefore functionally distinct. This simple correlation between receptors and neurons does not explain the much more complex processing that the brain must employ to discriminate an odor. For example, how does the brain determine which olfactory neurons have fired? In all other sensory systems, the brain relies on defined spatial patterns of neurons as well as the position of the neurons ultimate targets to define the quality of a sensation. Perhaps the brain applies a similar logic to the sense of smell. There are a number of potential scenarios for arranging neurons and axons in the nose and brain [see box below]. In one model, neurons that bear a given type of receptor would be localized in the olfactory epithelium. Activation of neurons at specific sites would then define the quality of an odor. Alternatively, neurons carrying one type of receptor could be randomly positioned in the epithelium, but their axons would converge on discrete areas in the brain. In this case, exposure to a particular odor would result in defined patterns of activity in the brain. In a third model, both the neurons and their projections to the brain could be arranged randomly. To interpret the scent, the brain would have to use a sophisticated algorithm to decode the random signals. Some neurons in the nose are spatially segregated according to the scents they detect. Most mammals, including humans, possess a vomeronasal organ that is physically separate from the main olfactory epithelium. The vomeronasal organ detects the pheromones that govern reproductive and social behaviors. The sexual response of male rodents to female rodents, for example, is an innate response, prompted in part by the detection at the vomeronasal organ of pheromones secreted by females. If the neurons in the vomeronasal system are genetically inactivated, the mice can still smell with their main olfactory system, but the inactivation of the vomeronasal organ results in males that attempt to mate with both sexes. Additionally, as Dulac, Buck and I have independently shown by studying the genes encoding pheromone receptors, the sequence of amino acids (the building blocks of proteins) in the receptors of the vomeronasal organ is completely different from that in the receptors of the main olfactory epithelium. These differences suggest that the two systems may have evolved independently of each other. Finally, neurons in the main olfactory epithelium project their axons to an area of the brain that is distinct from the region where neurons in the vomeronasal organ send nerve impulses. Consequently, signals from these two regions of the nose produce very different behavioral responses. The neurons of the vomeronasal organ bypass the cognitive centers of the brain and send signals directly to those areas that control innate behavioral and emotional responses. In contrast, the main epithelium sends signals to higher centers in the olfactory cortex that elicit more measured responses. THE ANATOMICAL SEGREGATION of these two functionally distinct olfactory systems immediately prompted us to examine whether neurons within the main olfactory system itself also exploit spatial segregation to define the quality of an odor. Some of this spatial organization is well known: each neuron projects a single, unbranched axon toward the brain. As the collection of axons emerges from the olfactory epithelium, about 10 million axons come together to form the olfactory nerve, which then enters the brain. Once inside the brain, groups of 10,000 axons converge at sites called glomeruli in the olfactory bulb. In the glomeruli the axons communicate with neurons that project to higher centers in the brain. Experiments done by Vassar in my lab at Columbia, as well as independent research carried out by Buck, showed that the olfactory epithelium is divided into four broad regions according to the types of receptors found in each zone. Despite this coarse organization, the most important feature of this arrangement is the random distribution of receptors within each region. Because we were unable to detect a more precise spatial pattern of neurons in the epithelium, we searched for a pattern in the projections of axons into the brain. If such a pattern is indeed employed, neurons expressing a given receptor, though randomly distributed throughout a region of the epithelium, must project their axons to a small number of glomeruli. Several pieces of evidence support this model. First, the number of glomeruli is roughly the same as the number of types of receptors; because each neuron expresses only one receptor, each type of neuron may connect to a characteristic glomerulus. 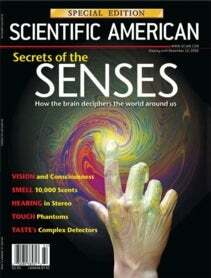 Second, physiological experiments have revealed that different odors elicit distinct patterns of activity in the brain. For example, Gordon M. Shepherd and his colleagues at Yale University established that exposure of newborn rodents to their mother's milk led to activity in restricted regions of the olfactory bulb. Similarly, John S. Kauer of Tufts University used voltage-sensitive dyes to show that the pattern of activity in the olfactory bulb is distinct for various odors. Furthermore, electrophysiological studies by Kensaku Mori, now at the University of Tokyo, directly demonstrated that distinct glomeruli are activated by different odors. More recent imaging studies by a number of labs using different animals have revealed that different odors elicit distinct and invariant patterns of glomerular activity. My colleagues and I devised two molecular approaches to study the spatial segregation of neurons and axons. First, Vassar, Steve K. Chao and Leslie B. Vosshall, working in my lab, modified the technique of molecular hybridization used in previous work so that we could examine receptor RNA in the tips of the axons, where they converge in the olfactory bulb. These experiments, as well as independent work by Buck, indicated that neurons expressing a given receptor project to one or, at most, a few glomeruli among the thousands within the olfactory bulb. Moreover, the positions of the glomeruli are fixed, assuring that a given odor will elicit the same pattern of activity in the brains of all animals in a species. In another approach, Peter Mombaerts, now at the Rockefeller University, and Fan Wang, now at Duke University, and I have genetically altered mice, breeding experimental animals in which neurons that activate a specific receptor were dyed blue. Our procedure involves isolating a gene for one of the odor receptors and then attaching to it a second, marker gene. This marker gene, which will become active whenever the odor receptor gene is expressed, triggers a chemical reaction that turns the neuron and its axon blue. The modified gene is inserted into cells that are then introduced into a mouse embryo. In the resulting mice that develop, neurons that make this particular receptor appear blue, allowing us to see where the cells are located [see box on opposite page]. We examined the olfactory epithelia and brains of the mice and observed that about one in 1,000 neurons were blue. Most important, individual axons stretching from the neurons could be identified and followed into the brain. The blue axons projected to only two of the 2,000 glomeruli in the olfactory bulb. These experiments provide convincing visual evidence that neurons that activate one type of receptor--and therefore respond to a limited number of odors--project their axons to a small number of glomeruli in the brain. Because the glomeruli in the olfactory bulb are differentially sensitive to specific odors, and the positions of the individual glomeruli are topologically defined, the olfactory bulb provides a two-dimensional map that identifies which of the numerous receptors have been activated in the nose. We believe a given odor will activate a characteristic combination of glomeruli in the olfactory bulb; signals from the glomeruli are then transmitted to the olfactory cortex, where they must be processed to allow odor discrimination. IN RECENT STUDIES, we have examined the relation between this anatomical map and the functional representation of olfactory information in the brain. To do this, we turned to the fruit fly Drosophila melanogaster, which exhibits complex behaviors controlled by an olfactory system that is anatomically and genetically simpler than that of vertebrates. We first demonstrated that the anatomical organization in the fruit fly is remarkably similar to that of the olfactory system of mammals--suggesting that the mechanism of odor discrimination has been shared despite the 600 million years of evolution separating insects from mammals. An understanding of the logic of odor perception requires functional analysis to identify odor-evoked patterns of activity in neural assemblies in the brain and ultimately the relevance of these patterns to odor discrimination. We have used the procedure known as two-photon calcium imaging to examine the relation between the anatomical map and the functional map in the fly equivalent of the olfactory bulb, the antennal lobe. Jing Wang and Allan Wong, in my lab, developed an isolated Drosophila brain preparation that is responsive to odor stimulation for several hours. These experiments allow us to observe the functional map of odor representation in brain space. Different odors each elicit different patterns of glomerular activation in the fly brain, and these patterns are conserved among different animals. Imaging experiments in vertebrates similarly reveal a functional representation of the anatomical map. Thus, the pattern of glomerular activation may confer a signature for different odors in the brain. This view of olfactory perception shares several basic features with perception in other sensory systems. For example, in vision the brain analyzes an image by interpreting the individual components: form, location, movement, color. The unity of an image is accomplished by reconstructing the signals in the visual centers of the higher cortex. In comparison, the brain analyzes an odor by dissecting the structural features of the scent. The odor is then reconstructed by the olfactory cortex. But how does the olfactory cortex, which receives signals from the olfactory bulb, decode the map provided by the olfactory bulb? This question is one of the central and most elusive problems in neurobiology. It seems likely that some form of spatial segregation, similar to that seen in the olfactory bulb but undoubtedly far more complex, will be maintained as the signals project into the cortex. This arrangement, however, merely places the problem of interpreting spatial information one level beyond the olfactory bulb, in the cortex. How does the cortex prompt the range of emotional or behavioral responses that smells often provoke? To what extent is the recognition of odors in humans conscious or nonconscious, and how much of behavior or mood is governed by the perception of odors in our environment? We have only begun to explore the logic of smell and how it can evoke the vast structure of recollection. RICHARD AXEL is University Professor at Columbia University, where he is also an investigator with the Howard Hughes Medical Institute. Axel is a molecular biologist who now applies the techniques of recombinant DNA and molecular genetics to problems in neurobiology. Most recently he has focused on the molecular biology of perception. In 2004 Axel shared the Nobel Prize in Physiology or Medicine with Linda B. Buck.